At a time of growing partisan polarization, Republicans and Democrats are deeply divided in their views of many issues and the opposing party. These differences extend to their opinions about the impact of many of the nation’s institutions, according to a Pew Research Center survey, and when it comes to the news media, this partisan gap is growing wider. Overall, the public continues to express negative views of the news media. Fully 70% say the news media have a negative effect on the way things are going in the country, while just 22% say the media have a positive effect. Majorities in both parties view the news media’s impact negatively, but this opinion is far more prevalent among Republicans and Republican-leaning independents (85%) than among Democrats and Democratic leaners (59%). Just 9% of Republicans say the media have a positive effect on the way things are going in the U.S., compared with 33% of Democrats. Republicans’ views of the news media have grown more negative over the past year. In October 2015, 76% of Republicans said the news media had a negative effect; 85% say this today. Democrats’ views of the media are little changed. Like their views of the news media, Republicans’ views of colleges and universities have grown less positive over the past year. Last fall, a 54% majority of Republicans saw colleges and universities as having a positive effect, 11 percentage points higher than today. The Pew Research Center survey, conducted Aug. 23-Sept. 2 among 1,201 U.S. adults, also finds large partisan divides in views of labor unions, colleges and universities, and churches and religious organizations. 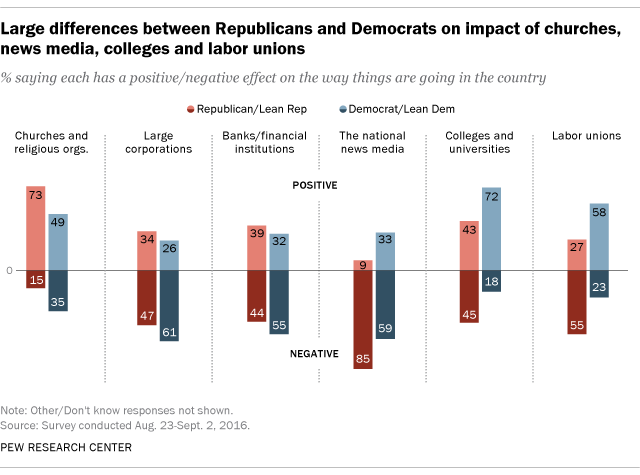 Democrats are about twice as likely as Republicans to view labor unions positively (58% vs. 27%), and while 72% of Democrats say colleges and universities have a positive effect, fewer than half of Republicans (43%) say the same. Views of churches and religious organizations also are divided along partisan lines, though in this case Republicans are more likely than Democrats to say they have a positive effect (73% vs. 49%). There are smaller partisan differences in opinions about the effect that large corporations and banks and financial institutions have on the nation. Fewer than half of Republicans (34%) and Democrats (26%) say corporations have a positive impact; 39% of Republicans and 32% of Democrats say banks have a positive impact. Overall, only two of the six institutions included in the survey – churches and religious institutions (57%) and colleges and universities (57%) – are viewed positively by majorities of the public. Note: See here for topline results of our survey and methodology.